In “Despicable Me 2,” Gru (Steve Carell) is back in the game, but this time he has been recruited by the Anti Villain League (AVL) to save the world. 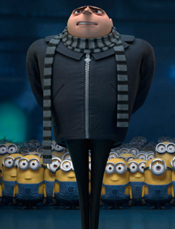 Along with Agnes, Edith, Margo and the Minions, Gru sets out to capture a Mexican villain named Eduardo. Marketing for the sequel began in 2012 with the Minions singing their rendition of “Barbara Ann” by The Beach Boys in a trailer attached to “The Lorax.” If you’re an adult without any children, “Despicable Me” may not have been a film you sought out intentionally, but it is quite an entertaining piece of animation. Quite honestly, my favorite part about the first film was, in fact, the antics of the little yellow characters that required some translation and Universal Pictures is capitalizing on the popularity of Gru’s henchmen in their marketing campaign. In the meantime, feast your eyes on these two short clips of the second film. One of the minions tests Gru’s patience. Agnes tells Gru she knows why he’s a boy. Steve Carell, Russell Brand, and Miranda Cosgrove return to reprise their roles while Kristen Wiig (who was Miss Hattie in the first film) will be the voice of Agent Lucy Wilde, who recruits Gru for AVL. They are joined by Al Pacino as Eduardo and Steve Coogan as Silas Ramsbottom, director of the Anti Villain League. “Despicable Me 2” is due out in theaters July 3.